In Christ. In Community. In Lebanon. This month's book response comes from Gene McCumber who serves in prayer, worship, and tech realms. As we read through book responses, may our ears be attentive to the Spirit and may our minds discern and consider truth well. Also remember the words of the Preacher from Ecclesiastes: The writing of many books is endless, and excessive devotion to books is wearying to the body. The conclusion, when all has been heard, is: fear God and keep His commandments. The Adventures of Tom Sawyer. Emma. The Picture of Dorian Gray. The Adventures of Huckleberry Finn. The Hobbit. If you were to pick up any one of these books, you would expect it to contain topics and stories surrounding the title character. You would expect that book to be about that person. If I mention the book of the Bible titled Revelation, where does your mind go? By default, my train of thought goes to “prophecy” and predictions about the future. However, that’s not the full title of the book. The full title of the book is The Revelation of Jesus Christ. That title should change what we can expect to find contained in this book. He then asks the reader to lay aside preconceived notions and hear, with fresh and open ears, the voice of a living God. Peterson warns against simply reading the words on the page. Reading something as words on a page and hearing them in the voice of the speaker are two different experiences. If you know me, you may or may not be reading this in my voice in your head. If you don’t know me, that’s not possible. Even if you do know me, which words am I emphasizing? Which thoughts am I punctuating? Where am I loud and excited? Where am I quiet and contemplative? When I’m the one speaking, these things are trivial. The importance of recognizing the voice of God is immense. Matching His words with His voice brings life to them. The words can then bring life to us. "The most-to-be feared attacks on the Christian faith go for the jugular of the word: twisting the word, denying the word, doubting the word. It is impressive how frequently the Psalmists denounced and cried out for help against lying lips and flattering tongues. Far more than they feared murderers, adulterers, usurers, and Egyptians, they feared liars. God made himself known to them by word, and it was by words that they shaped their response to him. When words are ruined, we are damaged at the core of our being. The subtlest and most common attach in the satanic assault on God’s ways among us is a subversion of the word." 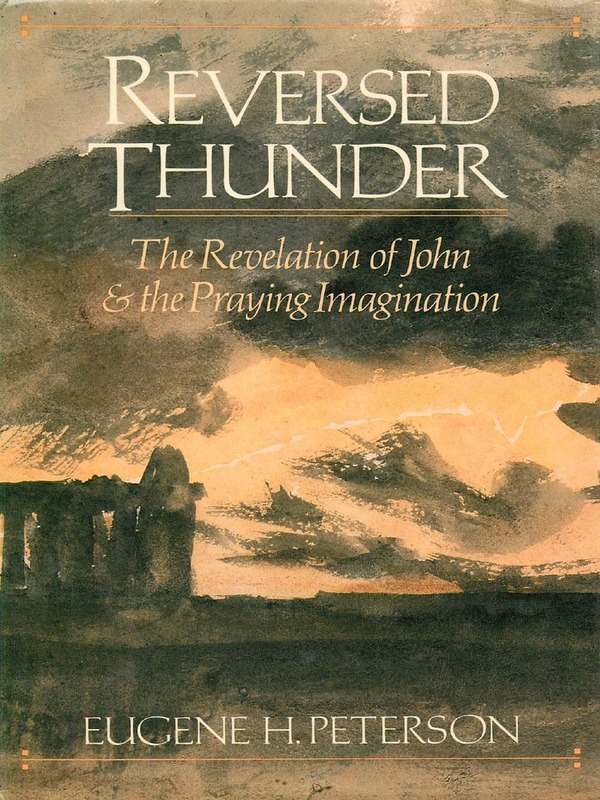 Reversed Thunder is based on the assumption that the book’s purpose is to reveal Christ in a new way. It is structured around the fact that the Revelation is the last book of the Bible and, therefore, has the last word. Peterson goes through the Revelation taking on one major theme at a time. He explores the Revelation as the last word on scripture, Christ, the Church, worship, evil, prayer, witness, politics, judgment, salvation, and Heaven. Within each of these topics, Peterson never strays from the central figure of Jesus Christ. "Everything in the Revelation can be found in the previous sixty-five books of the Bible. The Revelation adds nothing of substance to what we already know. The truth of the gospel is already complete, revealed in Jesus Christ." But what if “easy” and “safe” are no longer enough? What if the status quo doesn’t cut it anymore? Approaching a new outlook on The Revelation of Jesus Christ can be daunting. Pursuing God in His reality is a terrifying prospect for me. But that’s where life is. If you want a new perspective on the Revelation, I encourage you to let Eugene Peterson be the experienced guide to take you on that safari.